For me, worshiping is seldom about singing. Raised in a church that exclusively used a pipe organ to play songs that resembled a funeral dirge, I long ago was conditioned to mentally disengage when the music started. Even though the instruments have been updated to drums and guitars and the plodding hymns have been replaced by upbeat tunes, I still zone out while others are worshiping God via music. For me, I worship God by serving and helping others. I’d like to borrow that thought and restated it to: Show me your worship with music, and I will show you my worship without music. 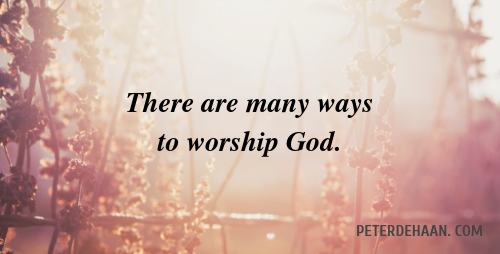 Thankfully, there are many ways to worship God.